This is my second post today. For my CAS(E) This Sketch card, please scroll down. This card is for Moxie Fab World's Make your own Background Paper challenge. I used the "I" from the My Stamp Box Tall Solids Alphabet to create the background. 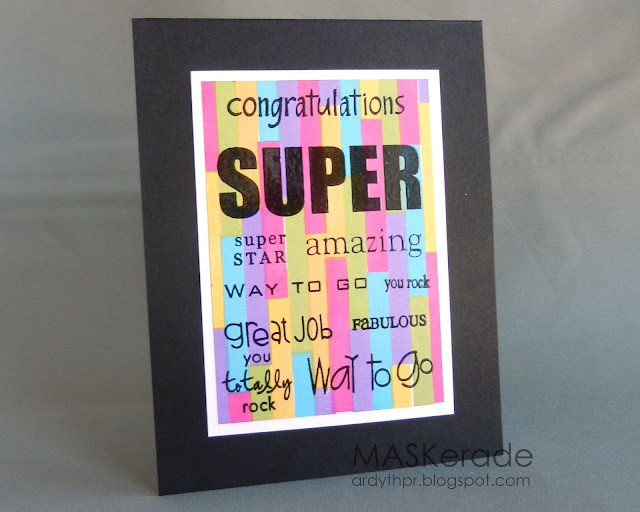 The various congratulatory sentiments were stamped in Versafine Onyx and embossed in clear. I matted the 'background paper' on white, to brighten the card up a little bit. Wow! What a fantastic, uplifting card! The black words just "pop" on your beautiful background. Fantastic Ardyth! I love this!!! These bright colours look fabulous behind the black sentiments. And who else would think to make a whole background from the letter "I"? I couldn't say it better than all those adjectives on this fab card! What a wonderful card! So bright and fun too. Love it! Awesome background! Super bright and fun. :) When you stamp and emboss so many different sentiments how do you do it? Do you stamp and emboss each one one at a time or stamp them all, add the powder to them all and then emboss? Wait ... whaaa?!? You stamped a background with an "i"? Do you know how crazy that sounds?! I'm gonna pick "great job you totally rock" from your card and insert that right here. What a fun background! It's even more impressive that you an alpha stamp to create it. Great job.